Three of the accused were convicted under Section 120B (conspiracy) – indicating that the court was convinced that the attack was pre-planned. Ramgarh (Jharkhand): A fast-track court in Jharkhand today convicted 11 of the 12 people accused in a cow vigilantism-related murder case. This is the first time people have been convicted in a case relating to violence in the name of cow protection anywhere in India. The sentencing will take place on March 21. Eleven of the accused – including a local BJP leader and three members of a gau raksha samiti – were convicted under IPC Section 302 (murder). In addition, three of them were convicted under Section 120B (conspiracy) – indicating that the court was convinced that the attack was pre-planned. The 12th accused was initially being treated as a juvenile, Indian Express reported, but the prosecution had asked that he be treated as an adult as he was above 16 years of age. This plea – based on a Code of Criminal Procedure amendment that says minors between the ages of 16 and 18 can be tried as adults if it can be proved that they were aware of the impact of their actions – is pending before the court. Defence lawyers told The Wire that they will be appealing the conviction. Alimuddin alias Asgar Ansari was lynched to death by a mob in Ramgarh on June 29, reportedly based on suspicions that he was carrying beef. 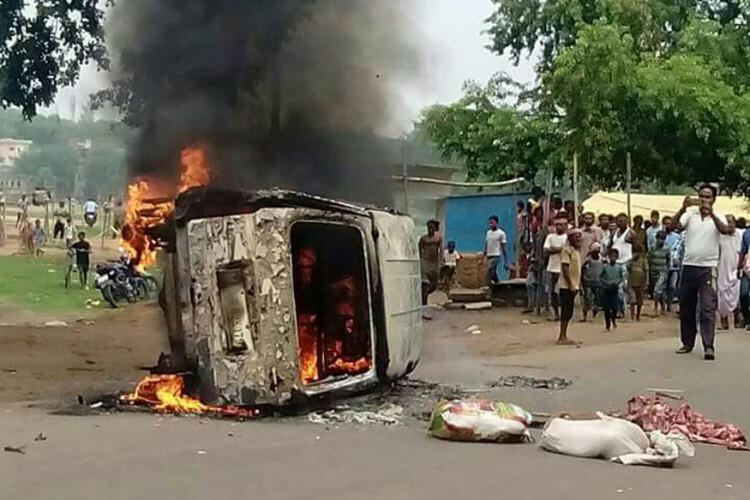 His lynching happened the day Prime Minister Narendra Modi decided to finally break his silence around the issue of cow vigilantism. Ansari was reportedly carrying about 200 kg of meat in his van when he was attacked. His car was also set on fire. Police had intervened, but he succumbed to his injuries soon after being admitted to a hospital. Two people were arrested in the case, including local BJP leader Nityanand Mahato. Another accused had surrendered. In videos of the assault that did the rounds on social media, the assailants were seen beating Ansari with pieces of meat while his car was on fire in the background. Note: This article has been edited as the previous version erroneously stated that only 11 persons were accused in the case.